Rochester, Mich. - The Youngstown State women's golf team finished second at the nine-team OU Golden Grizzlies Invitational which concluded on Tuesday at the Katke-Cousins Golf Course. Senior Emily Dixon won her third event of the fall with a two-round total of 144. Dixon was steady throughout the tournament firing even par 72's on Monday and on Tuesday. She was one shot behind Oakland's Morgan Smith after the first round before winning by an impressive six shots. Dixon's 72 was the lowest by two strokes on Tuesday. Dixon took first at the YSU Kickoff on August 31 and placed first in a recent dual match against Niagara. The Penguins carded a team total of 623 (310-313) and were nine shots back of Oakland which won the team championship with a 614. 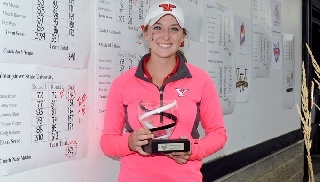 A pair of YSU freshman had top-10 finishes. Finishing in fifth place was Christina Cooper with a 157 (78-79) while Gabby Minor was tied for seventh with a 158 (77-81). Another freshman, Megan Creager was 11th with a 160 (79-81), while Courtney Shutt placed 18th with a 164 (83-81) and Emily Rohanna was 26th carding a 170 (85-85). YSU returns to action on Oct. 4-5 when it plays host to the Roseann Schwartz Invitational at the Avalon Lakes Golf Course in Warren.